Update: 15:10 Thanks to Claudio for sending over this enhanced version of the names on the trailer for those wondering who the 2nd name was. 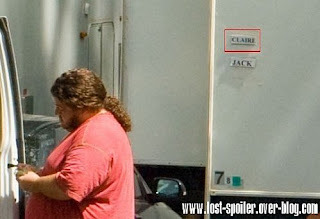 Thanks to my good friend Claudio for sending us this English version and photos of a recent set visit that one of their team from www.lost-spoiler.over-blog.com was lucky enough to witness. In parking ther was a lots of truck, I follow the way and the other side of a bridge there is a new little camp, I take pictures, we can see a Dharma logo. Half an hour later I returned to the parking and I see Jorge Garcia, he embarked in a van and climbs to a trail. I back to the camp again in a little path, I get near a group of technician and one of them is Jack Bender, and Jorge Garcia is repeating a scene. The team descends to return after dinner, next it started raining and it was impossible to take pictures, but I mingled with the technicians. They were filming for episode six, Jack Bender gave me a bottle of water, and they have started filming in the trail several times. They blocked access to both ends,I descended the first time, Matthew Fox was walking ahead of me, he revire to talk to someone. He wear a red sweater and a red spot on his forehead. During this time they installed a big camera in a tent, but security didn’t want I witness in the shooting. Matthew Fox is left with his car a little later, and apparently he has not turned to the scene of the camp. I left at 3PM. They had not started filming in the camp, but I knew there would be special effects and fire. The next day I went back to 13 hours, but they turned in another inaccessible location, I did not see anyone for two hours. I have other photos of the camp (next email), there is a chamgement the camp, I took pictures of the exact path where they filmed Jack and Hurley. Very beautiful tree easy to recognize, shooting back (they go down) and face. It has metal edges along the path. The day before, they camoufffé it with branches. This entry was posted in Uncategorized and tagged Behind the Scenes, Filming Updates, Hurley, Jack, Jack Bender, Jorge Garcia, Matthew Fox, Set Photos by admin. Bookmark the permalink.